These Golden Yellow beauties would be striking in any setting, but in this emerald glass vase they are truly gorgeous. A shower of gold that would please King Midas himself. Bold and brilliant alone, in perfect harmony with numerous other orchid varieties and hues. 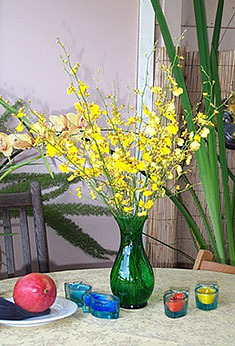 With proper care, freshly cut Oncidium blossoms will last up to two weeks in all their splendor. 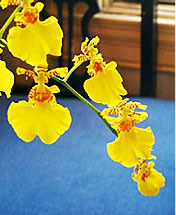 Enjoy them in your home, or delight someone special with the golden glory of this Oncidium bouquet. The arrangement above was created with 15 perfect stems of freshly cut oncidium in our classic green vase. Each purchase includes care instructions and an exquisite gift card for your personal message. Each stem is approximately 18-24 inches tall bearing 15-18 blooms and comes with individual water vials. The flowers measure approximately 1.5-2 inches in diameter.